Romita is a farmhouse in Tuscany with swimming pool and other services, perfect for your holiday! 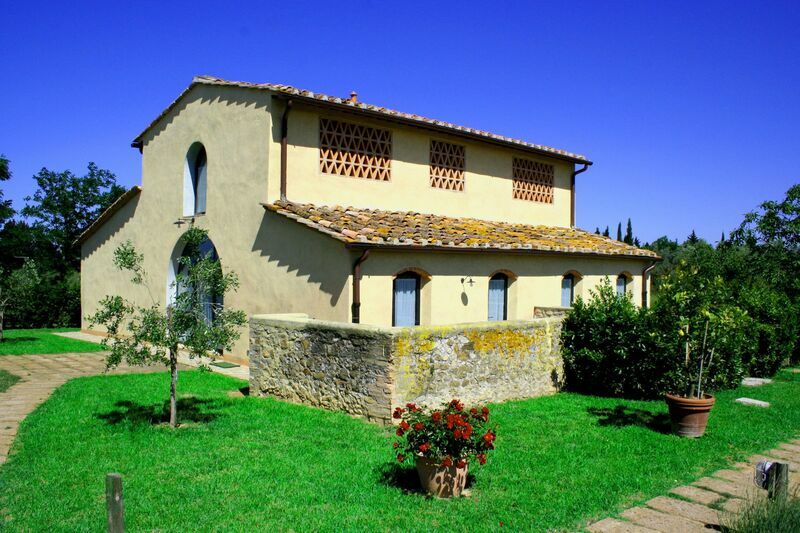 Charming barn situated in panoramic location on the hills of the Chianti Fiorentino region. This beautiful farmhouse in Tuscany has been recently restored preserving many of its ancient architectural features like the beautiful terracotta-tiled floors and the beamed ceilings, and turned into 2 nice apartments offering tastefully and comfortably furnished interiors. The barn is part of a large Tuscany farming estate producing excellent cheeses and affords extensive views over the surrounding landscape. The owners of the estate live in a restored farmhouse approx. 50 m from the barn away. Distances: food shops 1 km, Tavarnelle with all kinds of shops 6 km, San Casciano V.P. 8 km, Florence approx. 20 km, Siena approx. 40 km. A secondary road passes close by. At guests’ disposal: large garden furnished with garden furniture, above-ground swimming pool (8,30 x 3,55 m - max. depth 1,20 m - open from 01/05 to 30/09), shared barbecue. Iron available. Mosquito nets are provided in the bedrooms. Parking within the grounds. Possibility to rent the apartments Romita 1 and Romita 2 together in order to have an independent house for 8 people. Extra services: baby bed available by arrangement (€ 20,- / per week payable on the spot). Ground floor: living-room with dining area, kitchen corner (oven, freezer, dishwasher), double bedroom with ensuite bathroom with shower, twin-bedded room, bathroom with shower. Local Tax: 1,50€ per person/ per day for the first 7 days of stay.